Today was finally the performance day! Before we ventured to the school, we took a trip to a Buddhist temple. There were incense sticks as thick as my arm and as tall as my chest. Several different statues of different religious figures in Buddhism rose up from the ground. Some were guardians of the temples, others were the 18 original Buddhists. There was a gift shop at the temple where several of us purchased our own incense. After the temple we all gathered in the Hengshui auditorium for our final rehearsal. I volunteered to be a flag bearer for our school at the beginning of the performance along with other countrymen and women from places like Peru, South Korea, Ukraine, Russia, and Madagascar. Several of the international teachers at Hengshui High stood up to recognize the countries across the world. Students participating in China Foreign Exchange Program pose with Chinese dignitaries from around the region. During each rehearsal we would sit in the audience, exchanging emails and gifts with students from Hengshui. Hugh Smith was given an ink stone from the boy he hosted last year. Many of us have received candies, necklaces and other goodies. Rhea Singh and Brittany Ritchie got some private salsa lessons from one of the Peruvian men. They were ecstatic to say the least. After practice we went to lunch with the students and teachers. The school food is surprisingly delicious, but apparently they fed us something better than the food the kids eat. Oh the perks of being as tourist! After lunch we went to get makeup before the performance. All us guys were more than reluctant, but it was necessary and, to be honest, it’s hard to say no to the people at this school. They’re persistent to say the least. When makeup was done, we were free to roam the grounds or remain in the auditorium with the students. More than once the students who were performing from China told me not to be nervous. They seem to have a natural stage presence over here. Finally the performance came and the auditorium was jam packed with 2,000 students. We were even broadcasted on Hengshui’s equivalent to public access television. We performed in the second act and from the minute we stepped on stage the crowd was roaring. Caroline Price, Abi Cohen, Lacey Kirks and the Lord brothers were our lead vocalists and held microphones. They did a fantastic job at helping with the rest of our less “desirable” voices. Joe Hallal, Hugh Smith, Chris Lord and I all separated from our line of students to do some freestyle dancing at one point in our performance. Regardless of how well we did, we had a blast out there and the students seemed to feed off our energy. It was a great performance all around from all the countries. Their was traditional Ukrainian dancing, traditional Chinese music, singing from all over, English poetry, Peruvian dances and finally a group dance with all the performers to the song “Stronger” by Kelly Clarkson. There were chills on the back of my neck at the sight of all these people from around the world joining in a place as beautiful and historically rich as China in the name of peace and music. Andover High students put on a show for students and faculty from across the globe. After the performance we all went back to the hotel with some of the Hengshui students for what we thought would be our final banquet in Hengshui. 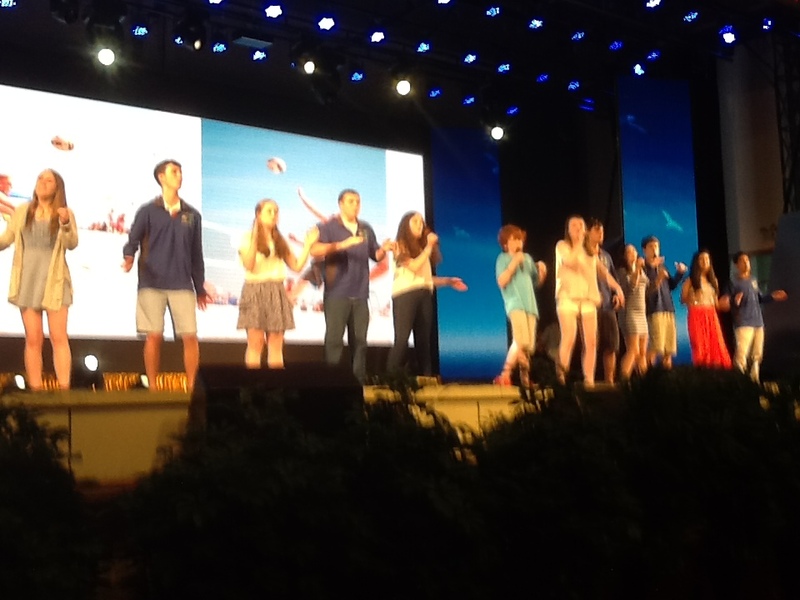 Lacey Kirks and Caroline Price joined some of the other American students and Hengshui kids on stage to sing a song. The students from Rhode Island did some step dancing and there was a formal gift exchange between the principal of Hengshui and Dr. Lord. Us students even received our own Hengshui uniform jackets. As the banquet winded down and we were preparing to say our last goodbyes, we were told that we’d be staying in Hengshui another night. The amount of joy on everyone’s faces, both Andoverites and Hengshuians, was unreal. Today we’re off to a snuff bottle factory and an elementary school, so stay tuned Warriors!